at Colormaker Industries in Brookvale. COVERED. caught up with him as he created a vibrant underwater seascape and spoke about his work and plans. Mulga’s colourful designs and characters and his intricate line work are easy to spot and have become a recognisable brand, not just as paintings but as designs on T-shirts, phone cases, tea towels, bags, cushion covers and stickers. It’s success that few people reach after years of perfecting their craft and yet art was not a first choice for Mulga, born and bred in Sutherland Shire. “I always liked art but I didn’t think it was something you could do as a job,” he explains. So he studied economics and worked as a financial planner for ten years. But he started dabbling with art and designs. “I draw a lot of bright colours and I like patterns and I make certain that I like looking at what I draw,” adds Mulga. 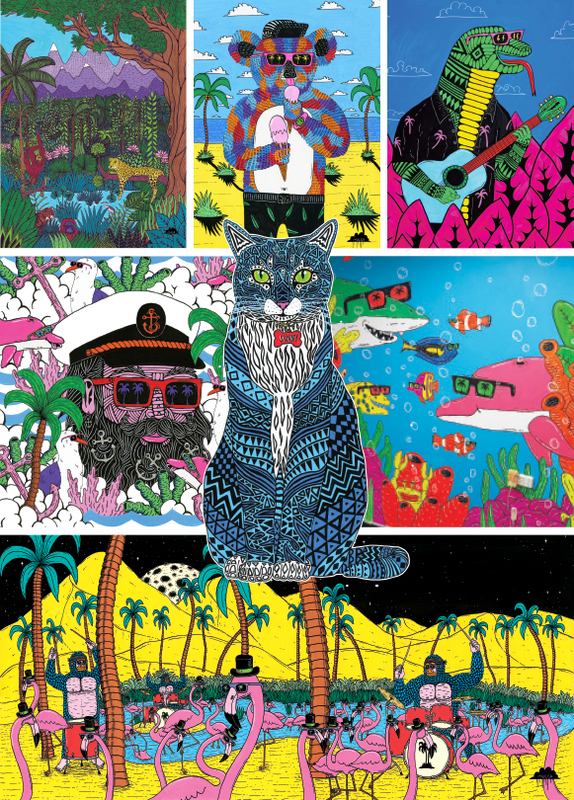 Mulga’s art brings to life a world where tropical bearded men run rampant, lions smoke tobacco pipes, tigers wear diamond sunglasses and gorillas rule the world like some kind of funky planet of the apes. He printed his work on T-shirts and sold them at markets after deciding this was the most lucrative way to showcase his work and build his brand. His first art show was in 2012 and in 2014 Mulga decided to make art his full-time career. He now has more than 60 shows under his belt, was winner of AS Colours Little Help Project t-shirt design competition, won gold at the 2013 Illustrators Australia awards and was a finalist and people’s choice winner at Hazelhurst’s 2013 Art on Paper prize. Having worked the market circuit for a few years, he now prefers to collaborate with businesses and brands. He has partnered with Samsung, Coca Cola, Toyota, Red Bull, Carlton, MTV, Adidas, Microsoft, Slurpee, Virgin Mobile, Jagermeister, CottonOn Kids, Flight of the Conchords, Universal Music, Sol Beer, Mambo, Oporto, Channel 7 Sunrise, The National Trust and Australia’s Got Talent. And of course, Colormaker in Brookvale! He enjoys writing a weird poem for every one of his creations because, ‘who doesn’t like a weird poem?’ and he reckons it’s a ‘neato’ way to make people smile. He is also author of a children’s book, Mulga’s Magical Musical Creature and Mulga’s Magical Colouring Book. As a dad of three – Pearl, aged eight, Frankie, who’s six and Louis, four, - Mulga gets plenty of practice as he has to draw a personally commissioned work for each child’s birthday each year.